Posted on Fri, Mar 9, 2012 : 8:07 a.m.
More than points are on the line this weekend when the No. 4 ranked Michigan hockey team hosts Notre Dame at Yost Ice Arena. It's the quarterfinal round of the CCHA playoffs, which means the teams will play a best-of-three series with the chance to play in next weekend's championships at Joe Louis Arena on the line. Michigan has advanced to the semifinals of the conference playoffs each of the past 23 years. Here are three things to watch for as the Wolverines attempt to keep their streak alive starting on Friday (7:35 p.m.). It’s officially the playoffs, which means intensity and hitting will be up and goals and penalties will be down. There’s no formula for playoff hockey, no particular reason players seem to play harder or better for that matter, but it’s undeniably a different animal. Michigan split its regular season series with Notre Dame in January. At the time, Michigan goaltender Shawn Hunwick said he thought Notre Dame forwards Anders Lee and T.J. Tynan were the most dangerous pairing in the country. Neither scored in the teams’ regular-season series, and they had just one goal between them in a first-round sweep of Ohio State, but Hunwick is standing by his statement. Brown thinks Michigan splitting its final regular season series with last-place Bowling Green indirectly prepared the team for this weekend’s matchup with Notre Dame. On Monday, senior forward David Wohlberg was sporting a pretty heavy beard, by his standards. He assured it was a spring break beard. Not a playoff beard. The players do hand out a hard-hat after a playoff win to recognize who worked the hardest. Even that tradition isn’t taken to heart too much. Both Brown and Moffie said they’ve been awarded the hard-hat, but couldn’t even remember when, who gave it to them or who they gave it to afterward. “The win sticks out more than winning the hard hat,” Moffie said. No, the legendary Michigan football coach and athletic director, after whom the hockey arena is named, will not be resurrected for the playoffs. Though some Michigan fans might argue he’s capable. The Children of Yost honor Texas native Chris Brown with the Lone Star Flag. They will fly a flag with the likeness of Fielding H. Yost on Friday. What will be at the game is Yost’s likeness as it's never been seen before, in the form of an 8-foot x12-foot flag. 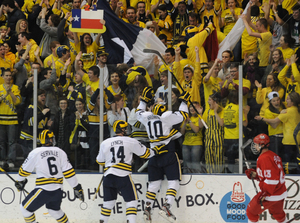 In recent years, the Michigan hockey student section has taken a liking to honoring players with huge flags representative of where they (pardon the pun) hail. A Swedish flag was flown for former captain Carl Hagelin and Texas native Brown has the Lone Star Flag flown for him when he scores. In mid-February, the “Children of Yost” -- as the group of fans prefer to be called -- decided to honor their father figure with a flag of his likeness. The only road bump was scrounging up the money to purchase the custom-made flag. They called out for support on the Internet and, within hours, had the necessary funds, thanks in large part to a donation from former Michigan and NHL player Aaron Ward. A picture of the flag was posted on the Children of Yost Twitter account on Thursday, with assurances that the flag would make its debut on Friday. Fri, Mar 9, 2012 : 4:47 p.m.
Go Blue. It's that time of year when Michigan hockey has always risen to the top one of the most remarkable streaks in athletics.